Hi I'm back with CodeIgniter Bootstrap Login Tutorial. In this post, we'll see How to Create Login Form in CodeIgniter and Bootstrap Framework along with MySQL Database. Similar to other articles in our codeigniter tutorial series, here too we use twitter bootstrap css to design user interface. Twitter Bootstrap has ready to use HTML Form Components which we use to style our codeigniter login form in seconds. To create codeigniter login page, I'm going to use MySQL as backend but you can switch over it to any other relational DBMS. Just change over database connection settings in codeigniter config file and you are done! Before heading to write any code for the login form in codeigniter, we'll fix the MySQL Database we need to use in our example. Run this SQL Command in MySQL Database to create the users table required for the codeIgniter bootstrap login system. Here is the Flow for the Login Form in CodeIgniter and Bootstrap we are going to build. User enters the username and password. Read database & check if an active user record exists with the same username and password. If succeeds, redirect user to the Main/Home Page. If it fails, show ERROR message. First create the model file for login form in codeigniter with name "login_model.php" in the "application/models" folder. Next create the controller for our codeigniter login form with the name "login.php" in the "application/controllers" folder. Finally create the view file with name "login_view.php" in the folder "application/views". Here is where we integrate bootstrap with codeigniter php framework and add HTML tags to create the actual login form in the codeigniter view. Note: You can load Bootstrap files from CDN to load faster. Include jQurey.js prior to bootstrap.js files as they depend on jQuery library. 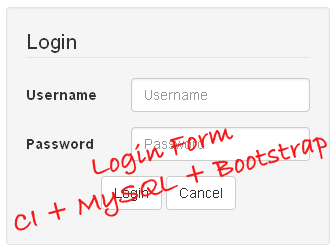 Have any problem in implementing this login form in codeigniter, bootstrap and mysql? Got some suggestion for improvement? Let me know through your comments. Look into our CodeIgniter Tutorials Section for more advanced articles. Hi, it seems like codeigniter's form helper is not loaded properly. Please make sure you have included it inside the controller's constructor function like this. Hi, unfortunatly this code is just into the controller, so the error persist. Have you any others ideas? i'm follow this steps but not solve my error...Help Me plz..!! I'm Follow this steps but not solve my error..Please Help Me...!! The error appear like this "The requested URL /.../login_c/index was not found on this server." Hi, thanks for your input. Yep! It's a good practice to stick on to the frameworks db handling features. But it's not necessary for the file names to start with caps although ci suggests naming the controller class names starting with caps. CI itself is somewhat inconsistent with naming convention rules and there aren't much. Irrespective of using upper or lower case namings, the above code works if you access the controller with the proper url. It worked, and no errors but where do I have to put the "status=' ' " part in the scripts above? And also I can't login, always result invalid login name and password. Hi, 'status' is a column name present in the db table and it should be set as active to allow the particular user to login to the site (useful for membership websites). And the answer for the second question is you should create a valid db table with field values and then use those login credentials with the script. Then it will work. Hi there, I get this error. I do i fix this. Before I already had mathevent database. Hi !! File names are case sensitive. Please check you use the same case as in view folder. The requested URL /newpro/login/index was not found on this server. Hi! CI follows a url structure like below unless you specifically rewrite the urls with htacess file. The default function called in controller is index(), so you need not specify it in the url. I can`t login. Invalid username and password! How can I add user to database ? Password field in database must be md5 sum or plain text? Hi! A valid user record should be present in the db for the login script to work. Usually for membership sites, the user records will be inserted with the sign up (registration) form. And yes the password should be md5 encrypted and stored in the db. Note: For testing this script you can just insert some user data to the db using mysql gui like phpmyadmin. hey why don't you provide demo of the example ..! also you can provide code in zip format...! This problem occurs when you try to call session library without loading it. its not connecting to the database? Please check this tutorial to properly configure and set up database connection in codeigniter. You have missed out the closing quotes. Also make sure to load the session library for this to work. During login process we store the 'username' in session variable. So you can use echo $this->session->userdata('username'); anywhere you want to display the logged-in username. The session data will be maintained until the user logs out. I am a noob and would like to know how do we integrate this user table into the db - do we add it to whatever app we have as a separate stand-alone table? Hi! This example uses MySQL DB. You have to create a database with name 'employee' and run the sql command given in the tutorial in MySQL. It'll automatically creates the required table structure. I'm glad you liked it! Thanks for your support. Thank you a lot for your article, it really helped me a lot. I have a strange problem here. When I load the page, it loads only till <php, and then - nothing. The only difference from your files is that I have header in separate file, so I'm including it with php also. And it works, so php itself is running. Hi! It's difficult to fix the problem without seeing your code. Any how I commonly see some people using opening & closing html tags on both views if they split up the header in a separate file. Make sure your header contains up to closing head tag and the body element & closing html tags are present in the other view file. Hi! You must have at least one user record in the database for the login process to work. Inserting some data and try out. Please note the password field is md5 and stored in database. i have the same problem... i have set up my database and table with md5 and still doesn't work.. plzzzzz help!!! Hi! I have updated the tutorial with user records for testing purpose. Please check it out. Hi! After im trying to login and failed. something wrong. You need to edit column password . Chage varchar(30) to varchar(35). Increasing the password column length in database will fix the issue. I have updated the post. Please check it out. i found one error in db structure. The password field of database [`password` varchar(30)] should be longer. In fact when i try to insert the MD5 value it's truncated. the field should be 32 char long at least. Thanks for your input. The password length has been gn wrong somehow. I'll fix it. Sorry! Just increase the password field length to 40 chars or more in database. That will fix the issue. When i click in login, the page redirect me to a blank page ! The scope of this tutorial is to show how to implement login page alone in a site. But in real world application, after successful login, the user should be redirected to some other pages like home or myaccount page. For that you have to build another controller for home page and redirect to it like this. Hope you get it right. Cheers. hi, can you share some details, how to build another controller for home page? I think its successfully logged in, but unable to find the next page. Like I mentioned above, once your login is successful you can redirect user to home page. To create home page you atleast need a controller and a view. Look in our ci tutorials section to know about creating controllers. The process has been referred several times. Can you copy paste your code in pastebin and provide me the link? I can check it out for you. I get this error: In order to use the Session class you are required to set an encryption key in your config file. Codeigniter needs you to set encryption key if you use session library. By default it will be set to null string in config.php file. Just add some encryption key in the config file. It seems like ci tries to store session details in the db. If you are using CI3 and chose session driver as database, then make sure you have the following settings in the config.php file. Also check you have this mysql database table for storing session data. Here is the official documentation link for the setup. during redirect, baseurl is also taken. so redirect is not working. what can i do for that? What's the issue you face? i had select the proper database. Hello Valli. I refer to your past tutorial 2 Step Registration with Email Verification http://www.kodingmadesimple.com/2015/08/create-simple-registration-form-codeigniter-email-verification.html The QUESTION is How can i check if my Account is activated? Example I login but my account is not Activated how can i check that??? Hi ,I am getting this kind of error ! Hi. I like your site it really useful to me as a beginners , anyway I'm so stock here when I login the username and password is going to login_form even though the username and password is not on databse w/c means is not matching ..
and when I login and login , the username and password is not validate . I mean NO Validation_errors(); says. How can we ensure that the restricted pages are accessed directly? What code will go in header in such case? I can not log in although i create a db named 'ict_aissignment' which has admin user that has "admin" password. It still shows "invalid user". After input username and password then click "Login" or press Enter, it redirect to localhost/xampp. Whats wrong with my code? Hello. I used this code in my editor and this piece of code: "form-horizontal", "id" => "loginform", "name" => "loginform"); echo form_open("login/index", $attributes);?> is displaying in my login form page in browser. I read the comments above and i noticed that someone else had the same problem. I followed ur suggestions but nothing happened. Please help me!